Three Hours of Instruction including complete Digital Swing Analysis, Personal Written Program, complete Equipment Evaluation/Recommendation, Lunch and a round of Golf. Schools can also be customized to fit a students specific needs and focus more on particular desired topics. Instruction includes Full Swing, Putting, Chipping, Pitching and Sand Play. Three hours of Instruction entirely devoted to the scoring shots of 100 yards and in. 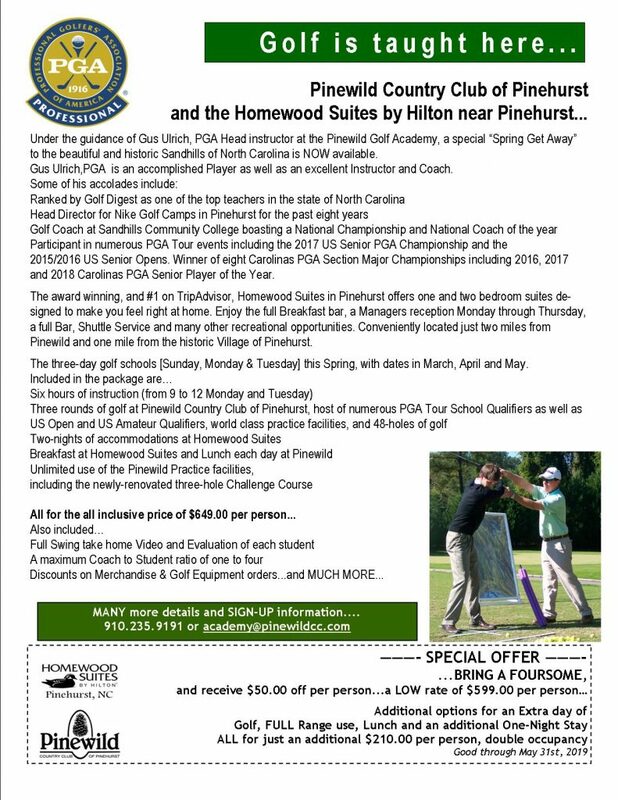 Each student receives a Personal Written Program, complete Equipment Evaluation/Recommendation, Lunch and a round of Golf. Instruction includes Putting, Chipping, Pitching and Sand Play. This includes an evaluation of Putting, Chipping, Pitching and Sand Play, along with suggested drills.